Get exclusive offers, parent resources, and more. This is City Square. Rosalita and Manny live here with their families in Miss Lily’s Pads apartment building. Rosalita lives in Apartment 5B. Manny lives below her in Apartment 2A. City Square is a busy place. 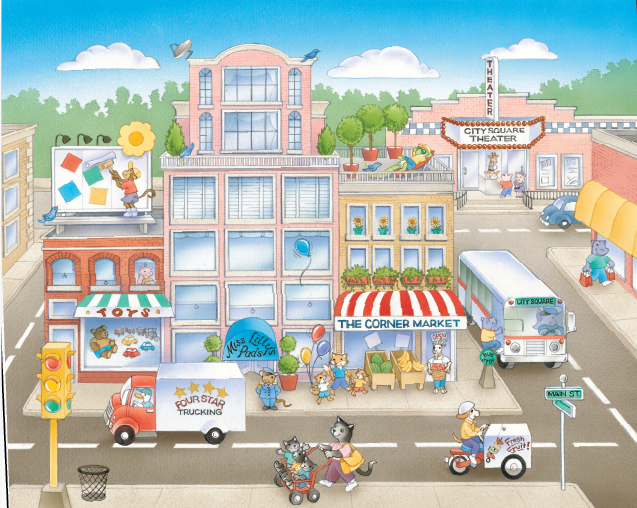 It has lots of buildings, stores, cars, and buses. Come to City Square and you might see Rosalita visiting a museum or Manny playing soccer in the park. From shopping at the Corner Market to seeing a show at the City Square Theater, City Square has something for everyone. © 2016 Robert-Leslie Publishing LLC. All Rights Reserved.